their wits and their pens, is frightening." State Of Play, the original TV drama by Paul Abbott, was a superb example of slow fuse intrigue and, by dint of casting coincidence, featured both John Simm and Philip Glenister who, a few years later, were to make such a time travelling splash in Life on Mars. Helmed by David Yates, in whose capable hands the second half of four movie-Harry Potters resides, the serial was directed with confidence and not too many nervous tics that punctuates modern TV. It was also six hours long. Lose two thirds of that plot, structure and minutiae and something's got to give. There was precious little play in the serial, so bereft of narrative fat, it would have qualified for a vitamin drip. State of Play, the movie, jettisons some of the labyrinthine detail and complexity of the BBC TV series on which it's based for a pretty solid reason. In their stead, the movie shores up the importance of the determined journalist and how impoverished a society we will foster if the profit motive sends all newspapers into ground bound tailspins. After all, six years between TV and movie is an eternity when it comes to economic and technological change. Newspapers are on their way out. There doesn't seem to be any doubt of that. If you've not read it already, get hold of a copy of Nick Davies' marvellous book Flat Earth News. It's the distant but building sound of the death knell of journalism and something that will put a huge dent in our culture if we simply allow newspapers and good investigative journalism to die – or worse, become simply broadsheet PR presentations. That we pay for. The truth may be out there but no bugger's going to find it if he/she has no training, time or talent to dig it up; let's not even consider the journalist's need to eat and pay rent. A crusading journalist is really doing a public service. It's the public that's the problem so force fed are we on the petty foie gras of celebrity swill that we are always missing the bigger picture. But perhaps we've reached a stage in our media soaked existence where Woodward and Bernstein would be an unknown pair of dogged hacks stifled at every turn by indifference, fear and the threat of their employers' financial ruin. All the more reason why we need movies like State Of Play. Director, Kevin Macdonald has a quietly impressive CV. Ten years ago, he won an Oscar for the stunning documentary, One Day In September, the perfect companion piece to Spielberg's Munich detailing the horrific events that lead to the massacre of the Israeli athletes in 1972. Straddling the drama and documentary was 2003's Touching The Void, a terrifying and exhausting account of an horrific mountain accident which deservedly nabbed the Alexander Korda BAFTA for Best British Film. His follow up, showing off Forest Whitaker's breadth of ability to inhabit Idi Amin, The Last King of Scotland, revealed McDonald's talent with actors. Whitaker got a Best Actor statuette for his efforts. No sooner had I written the above, did I hear a radio interview with Macdonald revealing that his grandfather was none other than Emeric Pressburger, fifty percent of the best film-making team this country may have ever produced. If there were any creative genes that needed to live on through descendents, Macdonald has them. In the big screen adaptation of the 2003 BBC six-part drama, the forty-one year old is now playing in the bigger sand pit with the likes of Russell Crowe and Ben Affleck. And he handles himself and the movie with assured aplomb. What is at the heart of my very thrilling fascination with the conspiracy movie? Boiled down to its movie DNA, it's the satisfaction at seeing a right shower of bastards getting their comeuppance. Heaven knows, it doesn't happen as often as it should in the real world. I adored All The President's Men and The Parallax View, State of Play's direct forefathers. Crusading journalist movies show us what a world might be if there was a system of fairness in place, a sort of democratic check and balance. It's one of the first things I taught my son. The world isn't fair, just abrasive and if you want fairness then create as much of it as you can. Yes, Warren Beatty's hero in the afore mentioned Parallax View ends up with a bullet which was not fair but the same enjoyment is had urging the good guys to do the right thing and uncover the conspiracies and murderers. Macdonald has admitted that he simplified the plot somewhat but what's left is still very satisfying. In short, Crowe is the idealistic journalist whose life has stalled due to unsatisfying romantic entanglements and a career path that has led him to be cynical and disrespectful of the ‘new news'. His low regard of political bloggers - those whose opinions take the place of facts from which faux self-serving stories are driven – leads him into conflict with Rachel McAdams playing Della Frye, a neophyte reporter with an open mind but no pen to hand. Two seemingly unconnected deaths prompt reporter Crowe to dig a bit deeper as his one time friend and congressman, Ben Affleck, turns up on his doorstep needing sanctuary. Affleck, it has to be said, despite the myriad of negatives he has accrued in a real J-Lo yo-yo of a career, is superb as the congressman with a few secrets to keep and corporate foes to vanquish. Let's not bring up Armageddon or his movie debacle, Gigli (blast). The one aspect of this writer/actor's past that sends me into paroxysms of frustrated fury is his L'Oreal ad. "Because you're worth it!" simpers this preening narcissistic arse. What happened to the integrity of Good Will Hunting (remember he got an Oscar for writing that) and the cool, laconic work with Kevin Smith? I'm with Bill Hicks on this. Rich people that do commercials (where the money goes into their pockets not into charities' bank accounts) have struck themselves off the artistic roster for life. How can they be taken seriously but then Hollywood has always lived by its own twisted rules. I've not seen Affleck's directorial outings (which I'm assured are pretty good) and I am prepared to eat my words if it's revealed that the L'Oreal commercial cash went to worthier causes than to induce a smile from Affleck's agent. The net seems to think otherwise. But hey, what does the net know? Back to the case in point. Affleck's slow deterioration punctuates the movie as a counterpoint to the brooding and introspective Crowe. Another actor with public relations on overtime, Russell Crowe is impressive as dogged reporter Cal McAffrey. Whether he put on the extra weight or it's make up, Crowe dives deeply into his characters and commitments. He's fearless as a character actor and perhaps more resentful of the attendant star status that accidental A-Listers pick up as baggage. What's an airborne Nokia between mates? What's important is the work and both Crowe and Affleck play believable characters in a dark, adult and tense thriller. As the plot percolates, the conspiracy is brought into sudden and wonderfully unexpected life that had this reviewer smiling at the cinematic sleight of hand. Macdonald's grip on the film is firm and the plot takes pleasing wrenches along the way. 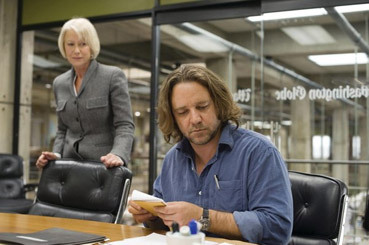 Nice to see Helen Mirren as Crowe's editor in the same awful dilemma as Streep's reporter in Redford's Lions For Lambs. You have a higher power looking over you and if that power isn't financially satisfied, you're out of a job. So how to do your job, the one you probably dreamed about since Nixon resigned? You just worry a lot and put in a glass case the sliver of integrity the business hasn't punched out of you. The plot makes pleasing twists and leaps, none of which feel forced or contrived and on the whole, although not a stunning piece of work, the movie is solid and dependably gripping. Journalistic integrity is not just on the line these days, it's on as many lines as John Belushi managed before they all disappeared up his ample nose and killed him. State Of Play celebrates the role of the honest journalist in a venal culture. See the movie and try not to see it as an all too early obituary.